Chhena Poda: Chhena poda is the quintessential cheese dessert from the state of Orissa in eastern India. Chhena poda literally means burnt cheese in Oriya. It is made of well-kneaded homemade cottage cheese or chhena, sugar, cashew nuts and raisins, and is baked for several hours until it browns. Chhena poda is the only well known Indian dessert whose flavour is predominantly derived from the caramelization of sugar. Thoroughly mash the chenna in a big bowl. Add in the semolina and powdered sugar. The chenna mixture will become very soft and crumbly. Add in the green cardamom powder, roasted chase nuts and raisins. Grease the baking tin well. Sprinkle a tablespoon of sugar in the tin. Spread the melted sugar evenly. Transfer the chenna mix over the caramelized sugar. Preheat the oven at 185°C. Bake the chenna mixture for 25-30 minutes. Let the chenna poda cool down to the room temperature. Remove the chenna poda from the baking tin. 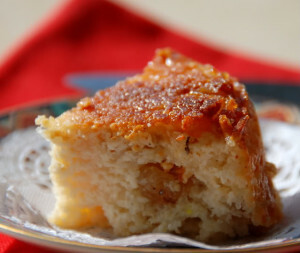 Note: Chenna poda stays fresh for a week in the refrigerator.